fs. Pan-American Journal of Aquatic Sciences, 6(3): 6. Download PDF file (66 Kb). fsfs. Pan-American Journal of Aquatic Sciences, 6(3): 6. Download PDF file (18 Kb). Bernini, E. & Rezende, C. E. Vegetation structure in a mangrove forest in Southeastern Brazil. Pan-American Journal of Aquatic Sciences, 6(3): 193-209. Download PDF file (651 Kb). Pinheiro, H. T., Martins, A. S. & Ara�jo, J. N. Demersal fish communities may indicate priority areas for marine resources conservation. Pan-American Journal of Aquatic Sciences, 6(3): 210-221. Download PDF file (429 Kb). Garc�a-Dom�nguez, F. A., Arellano-Mart�nez, M., Garc�a-Cuellar, J. A., L�pez-Rocha, J., Duprat-Bertazzi, G., Villalejo-Fuerte, M. & Tripp-Quezada, A. Reproductive cycle of the rock oyster, Hyotissa hyotis (Linn� 1758) (Mollusca, Bivalvia, Gryphaeidae) during El Ni�o 1997-98 and La Ni�a 1998-99 events at La Ballena Island, Gulf of California, Mexico. Pan-American Journal of Aquatic Sciences, 6(3): 222-231. Download PDF file (217 Kb). Orlov, A. Record of a tailless Richardson�s ray Bathyraja richardsoni (Garrick, 1961) (Rajiformes: Arhynchobatidae) caught off the Mid-Atlantic ridge. Pan-American Journal of Aquatic Sciences, 6(3): 232-236. Download PDF file (257 Kb). Machado, I., Conde, D. & Rodr�guez-Gra�a, L. Composition and spatial distribution of ichthyoplankton in intermittently-open coastal lagoons of Uruguay. Pan-American Journal of Aquatic Sciences, 6(3): 237-243. Download PDF file (647 Kb). Valls, F. C. L., Aparecida B. Basler, Bobsin, T. R., Scherer, J. F. M., Scherer, A. L., Marchetto, C, & Petry, M. V. Hawksbill turtle (Eretmochelys imbricata) (Linnaeus, 1766) found alive on the middle coast of Rio Grande do Sul, Brazil. Pan-American Journal of Aquatic Sciences, 6(3): 244-246. Download PDF file (218 Kb). Gonz�lez, S., Carranza, A., Scarabino, F., De Mello, C. & Ligrone, A. Coexistence patterns of benthic gastropods: the genus Buccinanops (Nassariidae) in the inner Uruguayan continental shelf and the R�o de la Plata estuary. 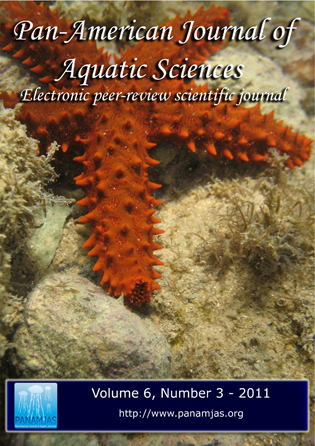 Pan-American Journal of Aquatic Sciences, 6(3): 247-259. Download PDF file (595 Kb).